Every time the Mummy franchise gets resurrected, it takes on a new attitude, spanning from the mood-heavy dread of the ‘30s classic to plucky, bombastic thrills in the ‘90s reboot. The inherent allure of Egyptian atmosphere and mysticism gives the concept flexibility in how to get an audience wrapped up in the undead concept, where the morbidity of animated flesh-eating corpses can effortlessly coexist with humor about the … uh, juiciness of dead bodies and the wildness of the embalming process. 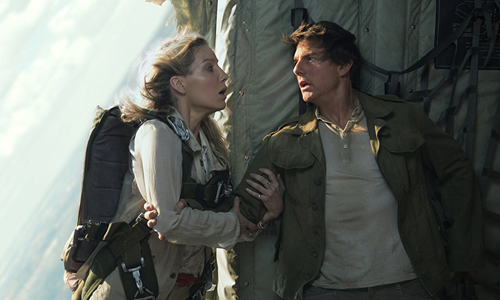 After nearly a decade without an appearance, Universal have now unleashed a new, ambitious The Mummy, in which they've recruited surefire leading man Tom Cruise -- and a gang of writers who have worked on his previous films -- to propel what's being billed as the origin of a new "Dark Universe", one that'd presumably incorporate the studio's other storied monsters. Plans for that might already be unraveling, though, following the release of this passably crafted, burdensome action-horror hybrid, which lacks either the necessary thrills or the charm of its lineage. No sign of Rick O'Connell in this Mummy, though, whose void has been filled by Nick Morton (Cruise), a rebel army sergeant who exploits intel about locations in the middle east to obtain valuables before an operation. While on one of these excursions with his partner, corporal Chris Vail (Jack Johnson), the pair accidentally expose some Egyptian architecture, which draws the attention of archaeologist Annabelle Wallis, an expert in the field. Circumstances lead to the unearthing of a mummy, Ahmanet (Sofia Boutella), an ancient Egyptian princess whose dealings with the underworld -- and a tumultuous relationship with her ruling-class family -- turned her into an immortal monster. In the fray, Nick becomes inextricably linked to the mummy, developing an otherworldly presence and awareness of his own. Reluctantly, he teams up with Annabelle and a mysterious supernatural expert (Russell Crowe) to combat Ahmanet, who makes her way toward civilization while extracting the life of humans to regain her strength. While Tom Cruise has embodied different sorts of renegade heroes and sympathetic bad guys across his career, he's trying on the skin of a different brand of character with Nick Morton, an antihero without a clear moral barometer who exists -- at least, for a while -- in the neutral ground between the two. There's no doubting Cruise's commitment to this or any other role, and he certainly delivers a robust, flawed protagonist with Morton, but he struggles to shake off the gallant leanings that naturally follow his persona around. So, when he tries to pull off the character's cheeky duplicity and questionable motives involved with his swindling, there's always an air of virtue lying underneath, something he's capably suppressed in his villainous pursuits. Unsurprisingly, Morton's moral alignment becomes a facet of the storytelling as he becomes entrenched in doomsday threats and the temptation of mystical powers, yet despite Cruise's best efforts and the script's overarching design, there's no surprises in the choices he makes. After a sluggish stretch of exposition in which Russell Crowe's booming voice articulates how English crusaders are connected to Egyptian relics, the action in The Mummy immediately kicks into gear amid the sands of Iraq, and there's no disputing the blockbuster weight involved. Heavy gunfire and sharp detonations force Cruise and Johnson through mazes of tan stairs and ramshackle rooftops, while the rise of the cannibalistic undead eventually generates chaos in the darkness, and it's all appropriately photographed and adorned with expensive-looking textural replications that grasp at that tomb-raiding, crypt-exploring visuals one would hope for. Unfortunately, between the half-dozen writers credited to The Mummy, whose work spans across Mission Impossible, Jack Reacher, and a ton of other big-budget excursions, a sensible chain of events couldn't be discovered. It's the kind of action extravaganza where crucial magical items are separated and brought together at the insistence of the film's momentum, where other events conveniently occur at the same time to make preventable developments happen by way of diversion and chaos. Too many cooks in the kitchen results in a product that's both heavy and bland. The faults of The Mummy cannot be traced to Sofia Boutella, who unleashes a fierce villainess with Ahmanet, a partially reinvented version of the Imhotep character from the older iterations of the franchise. Spurred by a yearning for political power in a male-dominated society during ancient Egypt, her motivations draw in a degree of sympathy fueled by undelivered promises and hierarchal disappointment, wrapping layers of modest justification around this ancient monster as she, uh, raises the dead and hurls the elements througha modern-day metropolitan area. Strategic visual effects cloaked in darkness execute convincing, if somewhat underwhelming, macabre displays of decaying flesh, but it's the subtleties of Boutella's makeup work in conjunction with her piercing gazes and her composed delivery of non-mustache-twirling villainous dialogue that enliven the undead character. These virtues come at the expense of monster-movie horror, as her merciless and threatening presence, even while sucking the essence from her victims, lacks actual terror in part because of how the film depicts her strife. No, The Mummy ultimately struggles to come alive because of the project's motivations behind creating a novel amalgamation between the eeriness of old and the jovial charisma of new, landing somewhere between the two in what ultimately functions as the origin of a "Dark Universe" primed for superheroics. Between the anachronistic presence of Russell Crowe's character in the modern era and the insubstantial disruptions created by Annabelle Wallis' useless scientist -- a far, far cry from Rachel Weisz' empowering "librarian" Evy -- the characters surrounding Nick Morton fail to inject personality into the transpiring bedlam, mostly serving as catalysts for Morton's understanding of his metaphysical powers. There's an air of melancholy hanging over Morton due to the nature of magical curses, yet they're also complimented by these sweeping speeches directed at him about following noble paths toward redemption, undercutting the compelling traits of these other characters in service of inspiring a reluctant antihero. At least these earlier parts of The Mummy fuse together into a connection of hybrid action-horror sequences worth remembering, because there's a point after one of the later tentpole sequences that the activity decays into a dark, disjointed carcass of a blockbuster that's a struggle to recall afterwards. Director Kurtzman's execution in the 11th hour might tap into alluring underwater imagery and busy visual effects involving zombie hordes, yet it functions underneath a veil of nonsensical, arbitrary mysticism that turns into a wash of indistinct sequences, ending on a peculiar uplifting note that insists on this being the monumental first ride through a sprawling new cinematic realm. The desired compulsion to return to this "Dark Universe" simply isn't there, though. In an early scene from the 1999 film, after a shipwreck, one group of treasure hunters thought they would beat their rivals -- Rick O'Connell and the gang -- to their destination because they ended up with all the horses, yet they shored up on the wrong side of a river. Perhaps The Mummy would've turned out better had the aspirations to revive and focus upon other monsters in future installments not distracted from this first entry landing at the right destination.